What is the Money Metals Exchange Affiliate Program? 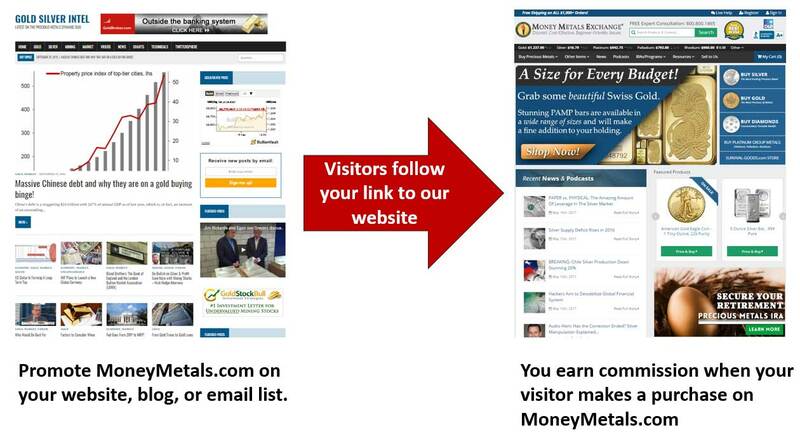 Money Metals Exchange is one of the easiest and most lucrative affiliate programs offered in the precious metals industry. Put simply, you'll receive a check each month for every online referral that you send to our website that results in a paid order within thirty days. The first step is to become an affiliate. Once approved, you can quickly and easily select from a variety of preconfigured text links, banners, and content that will link to MoneyMetals.com. Each time a visitor from your site clicks on one of our links or banners, they will be assigned a unique tracking link that records your website as the lead source. After that visitor makes a purchase on our website (either that day, or any time up to thirty days in the future), Money Metals Exchange will pay you a commission of $23 for each paid sale originating from your site. What Advertising Elements Do We Provide? Depending on your online marketing channels, Money Metals offers a wide variety of creative advertising elements including web banners, text links, and email creatives. These can be added to blogs, websites, posted to your social media platform, or sent to your newsletter subscribers. We even make full pages of content available if you would like to populate your site with our news articles. From within the affiliate portal, you can view your individual reporting data, detailing every step of the process from first click to verified sale. It only takes a few minutes, and you will get access to all the tools needed to get you up and running to start monetizing your visitors' demand for precious metals. Money Metals Exchange is one of the fastest growing precious metals dealers in the United States with over 75,000 customers. We offer a wide variety of gold, silver, platinum and palladium products at some of the lowest premiums in the industry, and we provide top-notch service, speedy delivery, and high-quality educational content. And we understand the value of our affiliate relationships and invest with a long-term view. That's why we are offering the highest per-transaction commissions of any precious metals merchant listed on Share-A-Sale. We pay a commission of $23 for each new customer that completes a purchase, regardless of the total sales amount, after the payment has cleared. Typically, bullion dealers operate on a razor thin margins (as do we), but we look at the bigger picture and understand the long-term value of recruiting new precious metals customers. We reward you for sending them to us. All orders are shipped within 48 hours after the customer's payment clears, and our knowledgeable and friendly customer service team follows up with each customer to ensure that we are meeting (and exceeding) their expectations.